Although modern smartphones have capabilities to measure and analyze your health data through some or other tracking sensors, limitations such as their weight, limited battery, weather restrictions and not to forget their extremely delicate screens that are highly likely to shatter easily make the desired purpose impractical. With many of such health tracking devices, we already seen in the market such as Fitbit, Samsung gear, Garmin Vivofit are doing well, Moov promises on their tracking results with extremely precise data recording and durable make. 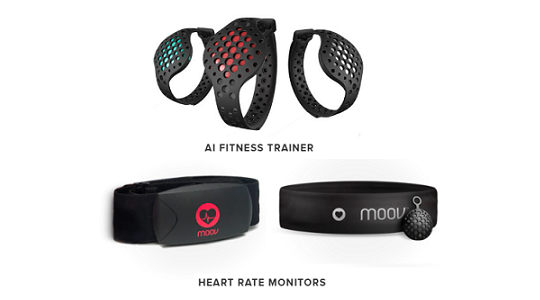 Yes, Moov Now and Moov Hr are their latest advance fitness tracking devices which can work under all conditions. The Moov HR is embedded in a unisex athletic headband which can precisely monitor your heart rate. The Moov Now comes with a more traditional watch-strap design with the capability to measure heart rate data through an external monitor via Bluetooth. These sturdy designed products work without screens and total shock and water resistant much suitable for a daily workout, traveling and other sports purpose. Even though Moov health trackers won't support your music or data storage, but surely give you exactly what you need out of a fitness tracker for a fraction of the cost of those more feature rich products.